I had around 40 attend the meeting in Silicon Graphics hall at Garden place, which by the way is now my favorite venue in Japan (thank you so much SGI). Later 25 came out for beer consumption at the beer station nearby. How good did it go? Well. we were ALL the last people in the beer hall, and we went out for more beer at an English pub nearby. Considering the extreme range of experience and company sizes, nobody is ever too proud to help our fellow RenderMen! you can read more at RenderSan. If you don't know who Yoshida san is you must have had your head up your server all year. Not only is he a wonderful down to earth kind of guy, but he is one of Japan's proudest exports to Hollywood. Because I was in a rush this month I sent out invites late so we had our smallest turnout ever! - around 15. However being a small dinner meant everyone got to speak to him and were all inspired. I normally don't talk too much about the places we went to but this place Chanto in Shibuya (ちゃんと渋谷 公園通り店) the service was substandard - the food was good and cheap, however we were supposed to have 2 hours all you can drink. After one and a half hours they said it was the last order because at the end of 2 hours we had to make room for others. We went out to a place nearby to continue our chat. This party seemed special because Yoshida San had worked in Japan previously so he really did inspire my friends. 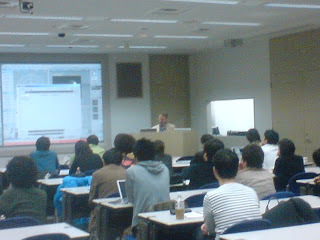 I have 2 events in Tokyo going this month(November 2008), if you are interested please mail me back. On the 15th we have the special guest Party. On the 22nd is Rendersan and afterwards drinks. For the 15th Party please RSVP before midnight of the 12th. For the 22nd RenderSan and drinks please RSVP before midnight of the 17th. Went to an amazing hand made candy shop. Lots of wonderful colors, caustics, anisotropic and subsurface effects. I made a mistake and shot the photos in b&w - oh well have to go again next week!